Our ocean view, two-bedroom, two-bath condominium is located near the front of Maui Kamaole and is located up one flight of stairs on the second level. Inside you will notice it is designed in the style of a townhouse with the master bedroom on the main floor and a second bedroom and bath upstairs. The tastefully decorated living and dining rooms are adjacent to the open kitchen. The area feels spacious with the room extending out onto the lanai through the double sliding doors. The vaulted and beamed ceiling adds to the openness. The kitchen, with its new appliances, is fully equipped for all your cooking and serving needs. On the main floor you will find a large bedroom and adjacent bathroom with two sinks and a shower. The room is furnished with a California King bed and offers a private, sunny lanai among the palm trees. As you walk from this bedroom down the hallway the crystal blue ocean draws you into the living area. The upstairs bedroom overlooks the room below, but can be closed off for privacy. The spacious room features two queen beds, an atrium, and a private bath with a shower. Both bedrooms are attractively appointed with fine linens, bedside tables and lamps, dressers, mirrors, televisions and DVD players. 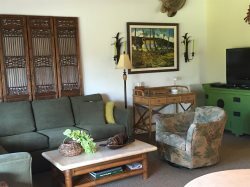 To make your stay at Maui Kamaole special, we have included all the conveniences of home, plus many extras. Our bright and cheery home is decorated with unique Hawaiian touches. The temperature in the condo is very comfortable due to the gentle breezes and good cross ventilation. If you prefer it cooler, each room has a ceiling fan and air conditioner. We also have a large awning to provide shade while on the lanai. There is a 43" television, DVD player and stereo in the living room, in addition to a TV in the upstairs bedroom. You will also find a single, roll-away bed(74x30") for small children along with a Pack 'n Play portable crib and two baby gates. The condo is also equipped with stackable washer/dryer, games, boogie boards, beach chairs, umbrellas, and beach towels for your use. The check in time for this unit is 2:00 PM and check out is 10:00 AM. For guests needing a late departure due to their airline schedule, we offer a half price daily rate. This unit has one parking space assigned to it. Additional parking spaces can be reserved for a slight fee. We have an on island contact who handles the cleaning plus any issues that may arise during your stay. Upon paying the balance of your reservation, a letter of instructions for the condo and Maui Kamaole is sent to via email.